Five Of Five – Inspirational Romance Giveaway Bonanza! Happy Friday Everyone! I hope everyone is having a great start to their weekend. 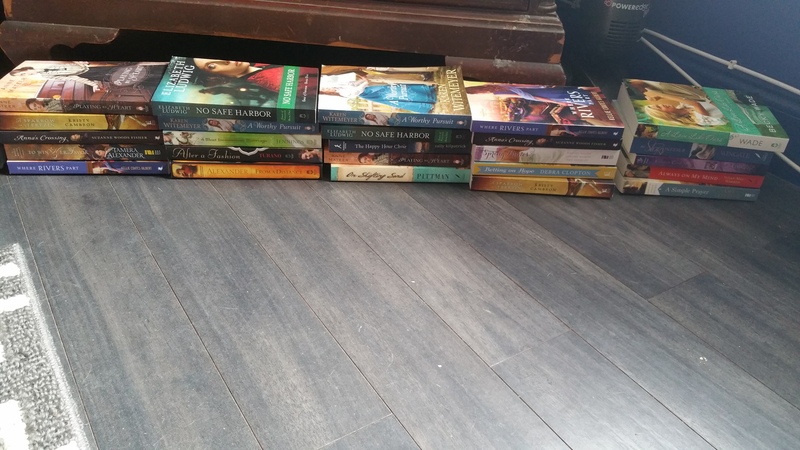 I have been going through my books from #RT15 and I got a TON of inspirational novels from Bethany House, Astraea Press, Thomas Nelson Books and more. Sorry to say, it’s not my genre, but alas, my loss is the gain of five others. I’m giving away five stacks of five inspirational books. I’m going to be honest. I’m lazy. I don’t want to go through and find the blurb for each book, so here’s a pic of all of them, sitting on my floor in stacks, awaiting their new home. Should you find you want one of these goodies (winners chosen at random via Rafflecopter) feel free to enter! I’ll close the on Friday, June 5th, announce the winners over the weekend, and hopefully be able to send them out for you the following week. All the books are varied, and I made sure not to put the same title twice in a single stack. Please don’t ask me to switch out the books. It’s all random and that’s part of the fun! Never Be Younger Release Day Blitz! Tess in Boots by Courtney Gager. It’s so adorable. It’s sweet and funny and the hero is totally swoon worthy. Thanks Kara! Has anyone told you how amazing you are today? If not, let me be the first! It’s easy to pick my favorite book. My mom got me a 1st edition Poe, vol.3, when I was younger and I just love everything about it. But recently, I’ve really been getting into The December People Series by Sharon Bayliss. I like the new blog by the way!